Diversify Side Income Or Specialize? I can’t think of a time in my adult life when I haven’t been fully immersed in a full-time job or career, while also making income on the side. Of course, I didn’t know that the term for this was “side hustling” when I first started out, but now I know all too well that many personal finance experts and even regular bloggers believe that side hustling can propel you forward faster than many money saving and frugality endeavours ever will. My first side hustle was a part-time job at the local mall where I held my full-time day job. I was a teenager, and my friend was working at a store that was understaffed. She offered me a few hours a week, and I accepted on the spot. When I moved, I started When Life Gives You Lemons. While it wasn’t a side hustle, it surely was a part-time job considering all of the time and effort it needed to succeed, and I credit that blog for stoking many of the relationships and connections that I’ve made which have helped me pick up my online gigs. A couple of years ago, I took a part-time, 30 hour per week job to get my foot in the door at the company I currently work for. I had not wanted to work part-time, so I took a babysitting gig in the evenings to make up the difference. I stuck with that until just recently, even though I’d transferred to full-time at my day job just months after accepting the initial offer. Since then, I’ve done everything from painting fence boards, to refinishing a piece of furniture, to offering blog consulting and commenting services. My side hustles have been diverse and I’ve enjoyed every single one of them. I’ve always taken solace in the fact that, if I lose one side hustle, I’d have another side hustle to fall back on. If I lost my regular day job, I’d have a wide range of side income that I could expand into regular income. Up until this point, my side income has been well diversified. My approach has been to take on different types of jobs, and always keep earning extra money. A big bonus of this approach is that you never get bored with your side hustles since you are doing something different for each client. However, I’m beginning to re-think my approach. Despite the benefits I’ve already listed to having a diverse range of side income, there’s something to be said about specializing. There are certain side hustlers in the personal finance blogosphere, for instance, who only offer carnival submission services, or web design services. Because they specialize in these areas, they likely have the ability to do the work faster, as they often have to juggle multiple clients for the same tasks at once. Another big benefit to specialization is that potential clients think of you when you are specialized in the task they are looking for. The more people see your name out there, the more they link you to the side job that you do. Sure, the majority of the work that you get will be in that particular niche of side work, but you’ll likely get a lot more of it. Finally, a huge bonus to paring down the side jobs to just one would be the ability to become an expert in that job. I would argue that you still have that ability when you do more than one job, but if you are focusing all of your extra earning energy on one thing, it’s bound to come more quickly to you. If you need equipment or software for a specific job or group of jobs, by specializing you’ll get your money’s worth out of that purchase, too. There are fewer costs to just doing one thing as opposed to having your hands in everything. There are pros and cons to each method, but as I’ve pondered it over the past few months, I have considered paring down my side jobs only to my online, blog related ones to remain focused. 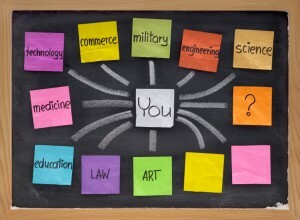 Do you specialize, or are you a jack/jill of all trades? Great post, Daisy! I’ve enjoyed your posts on “If Live gives you Lemons…” I’ve struggled with this lately as well. On the one hand I REALLY desire to have multiple side income streams. It’s the ultimate diversification of income. On the other hand I’ve seen how focusing on one side hustle at a time is more effective. I currently have my blog plus one freelance writing job, but would like to add more. I also really enjoy Excel and spreadsheet work though it became too much with the blog. I’d like to get back into it, but first I need to figure out what to do with my blog so that it can continue to grow even if I contribute less time. It’s a difficult balance to achieve, but I think if you are just want to have fun and make money, take whichever path will get you there! I’ve had different sots of side income for most of my years out of college. It’s nice to mix things up and keep things fresh. Anything gets old after a while! It’s always nice to mix things up and learn something new. I’m struggling with focusing enough to get things up and running, instead of dreaming of way too many ideas. I’ve got myself to a point where I *think* I can start another site without totally ignoring my current one, so hopefully that works. As soon as the next site is at a semi-sustainable point, I need to finish writing a book I started and figure out how to publish it! I think I have the opposite problem! I love getting things up and running but sometimes do so without actually focusing enough to plan and dream and figure it out before hand. Good luck! !